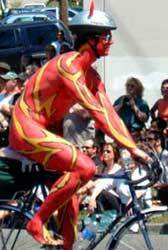 Body painting has served in both a serious capacity and a comedic one as far as body art goes. Some tribal groups incorporate ritualistic body painting into festivals and rite of passage ceremonies. 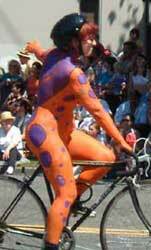 Many modern day, Western instances of body painting are also humorous or comedic in nature. Shamans and clowns have common ancestry as ritualized magic makers. Stylized warpaint has given way to face and body painting with coordinating sports teams colors. There may be less actual bloodshed, but the taking on of common colors or appearances as a way of sharing power has not changed one bit over time. At adult-oriented conventions and Halloween events, you will see painted costumes, with participants wearing full body makeup or liquid latex as their outfit in conjunction with very discrete underwear. Extensive text overview of body art practices. Much more history and more photographic content than the body art kit version.